The device is develop for car using with Bluetooth MP3 player,, equipped with professional high-performance Bluetooth module and mp3 decoder chip. It sends the signal wirelessly, without modifying anything in the car, also as an entertainment music player and as a safety and accessible car kit. 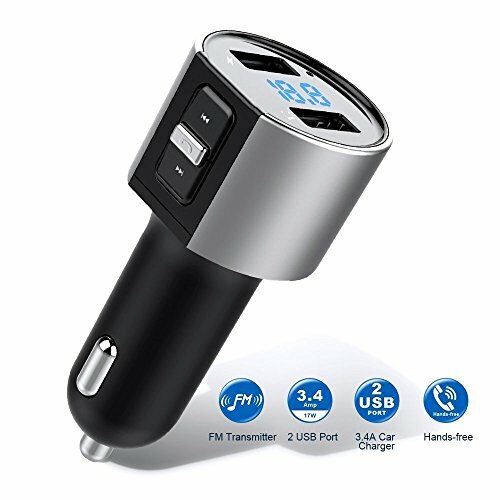 - Insert a Micro USB Flash Driver or pair this Bluetooth FM transmitter with your digital device to enjoy music playback or hands-free conversation. 【LCD & Voice Reminder】 On powered, display voltage, frequency of working status. Voice prompts when Bluetooth connection, the FM adapter screen displays BT mode. Full-frequency launch, 87.5-108.0MHZ. 【USB Flash HiFi Music Player】 Insert the U disk (up to 32GB) which contains music files, adjust the FM frequency of the wireless car adapter and car FM frequency line to enjoy your music. 【Support Playlist of Phone】 Another way to play music on the wireless FM transmitter. Connect your phone, then your music on the your phone can be sent to the car stereo to play. Support MP3 and WMA format files. 【Bluetooth Hands-free Calling】 When calling coming, automatic pause music, driving safer, navigation volume amplification, while listening to music, navigating, charging, automatic amplification of mobile phone navigation voice volume. 【Dual USB & Wide Compatibility】 In car charger comes with 5V/1A charge output and 5V/3.4A USB ports. Supports high-current equipment charging, such as iPad. Compatible with MP3, WMA, iPhone, iPad, iPod, HTC, android Phones and other Bluetooth enabled devices. If you have any questions about this product by Foneda, contact us by completing and submitting the form below. If you are looking for a specif part number, please include it with your message.